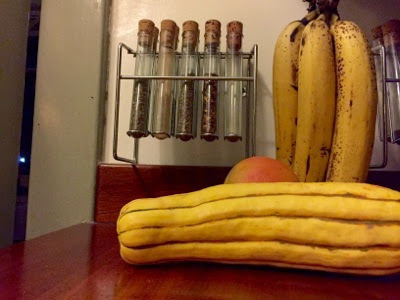 After having struggled with a kabocha or two as well as several butternut squash, I've decided that the delicata is my squash because you can eat the skin and it's not as difficult to cut. 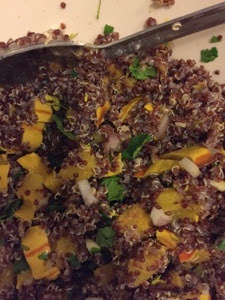 For my first squash of this type I decided to make a little salad with quinoa and serve them with lettuce and mustard green leaves for wrapping. The details of this delicious and nutritious meal are below. 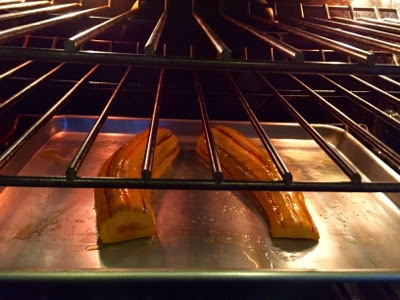 In a 350 degree oven, place an oiled pan with a halved, seeded, salted, and olive oiled delicata, cut side down. Roast for 30-45 minutes until tender. Go easy on the olive oil, or your squash will be mush. Meanwhile, cook the quinoa, and chop a shallot, 2 cloves of garlic, some mint, and some parsley. I made a cup of quinoa, so I used about a handful of mint and one of parsley. I also cooked the quinoa in miso broth for extra flavor and added a sprinkling of mizuna flowers since my garden is full of the tasty, pretty things right now. Next, whisk together 1 tablespoon honey, 2 tablespoons of sherry vinegar, and 1 tablespoon of extra virgin olive oil and lemon zest. When the quinoa is cooked and the squash is tender, dice the squash and combine all of the ingredients gently in a large bowl. 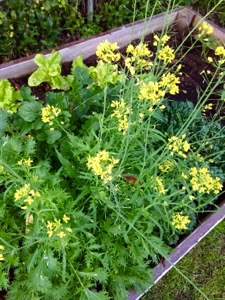 Serve immediately with the edible leaves of your choice. Oh, and did I roast those delicata seeds with extra virgin olive oil, chili pepper, black sesame, white sesame, dried orange peel, dried basil, and ground Sichuan pepper. Delicious! 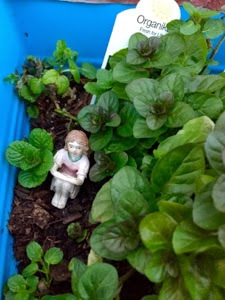 Someone put whimsy in my mint!